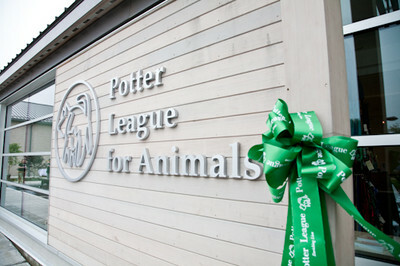 Founded 80 years ago, The Potter League for Animals is a non-profit organization dedicated to making a difference in the lives of animals. 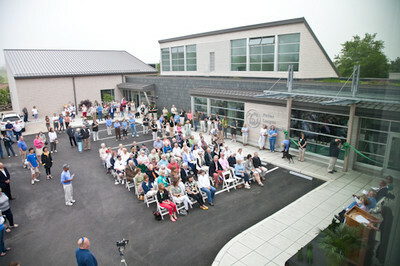 After 14 months of construction of their now new 19,500 square foot facility, they held their Grand Opening Celebration and Ribbon Cutting Ceremony on Saturday, June 20, 2009. This essay highlights the day's celebration, the amazing work of the staff and volunteers and the furry residents that make the Potter League and their new space so special. Support the Potter League today. "Enriching Lives" is the Potter League philosophy, one which touches every aspect of the shelter; from the commitment and spirit of it's staff, volunteers, board members and donors, to the happy furry residents, to the quality of the shelter's design. 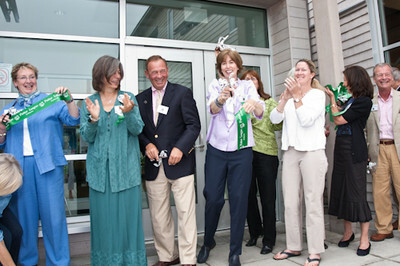 President of the Board, Sheila Reilly, charismatically opened the day's celebrations. When asked for comments, Sheilla stated: "This is a 21st century model and great leap forward for humane sheltering and was created first and foremost with the animals in mind." Despite threatening clouds, crowds gathered to share the exciting and long awaited moment. 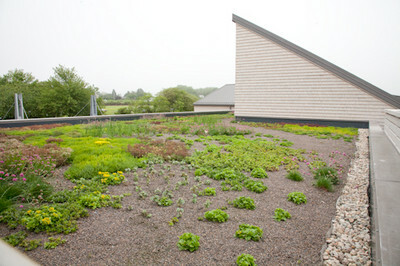 The vegetated roof is a favorite and just one small example of the "All-Green" design concept of the facility. It helps insulate the building and drops the temperature inside considerably in the summer, keeping everyone cool and comfortable while still conserving energy. 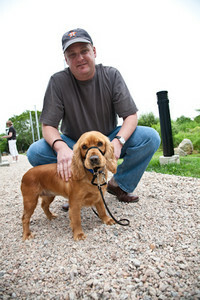 Committed volunteer for 17 years, Jason McCarthy, offers his hand to greet an equally friendly four-legged guest. 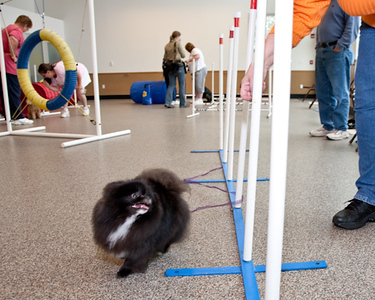 Flexible space in the Behavior and Training Center creates a fun and open environment for dogs and their owners to participate in a plethora of programs, from obedience to agility to Potter Pet University and more. Sue Sullivan is a member of the great training team. 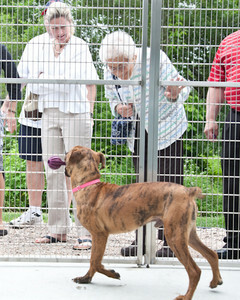 During the open house celebration owners stopped by with their dogs to participate in obedience and agility demos throughout the day. Be it agility or rolling around in the sun, the Potter League has it all if you're a dog. And they haven't forgotten their feline residents in the new building. 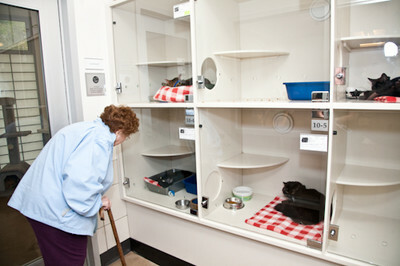 Separate, sound proof, well-ventilated accommodations provide kitties a quiet space while still being able to engage with visitors seeking a new family member. 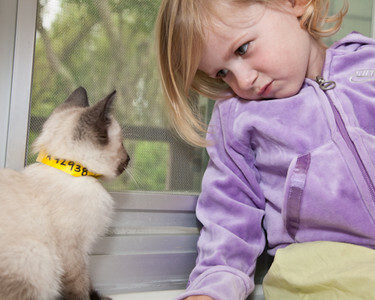 A kitten who will soon go home dares a visitor to a staring contest. Not sure who won...our money is on the kitten. Rooms of varied size and with an array of features are great spots to get to know the many kittens at the Potter League. And you get to see them in action, or not so much action, with each other. 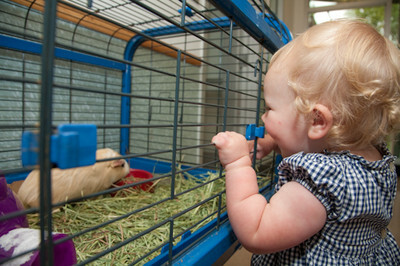 Not only for dogs and cats, the Potter League also provides shelter to small animals such as guinea pigs, hamsters and bunnies. It's an environment where children can learn at an early age how creatures great and small enrich our lives and deserve our respect and care. 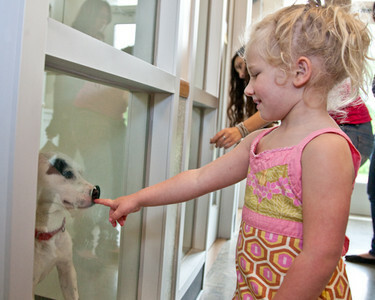 A little girl giggles with delight as she gets a wet sniff and kisses from a very cute puppy. A beautiful, adolescent pit bull, playfully struts his stuff to a delighted audience. 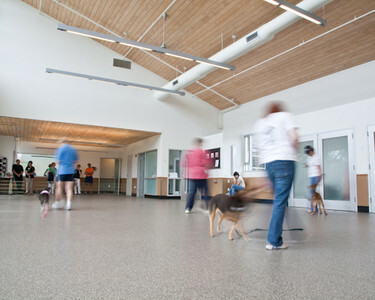 The new building has shared indoor and outdoor play areas attached to 10 dog adoption rooms, offering room for socializing and exercise, but also quiet time. 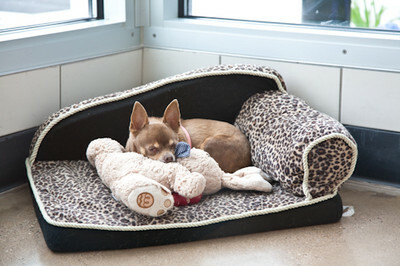 Feeling safe and getting snoozy is all part of the "Enriching Lives" philosophy and experience. 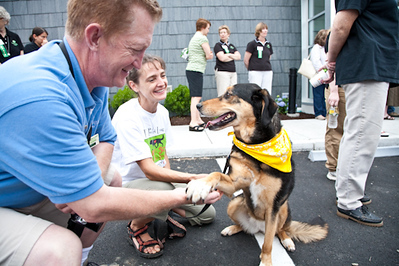 Be it a visitor, volunteer or staff member, each furry resident of the Potter League gets one-on-one attention on a daily basis. The amazing team makes each pet feel like a special member of the Potter League family, no matter whether their stay is a few weeks or months. 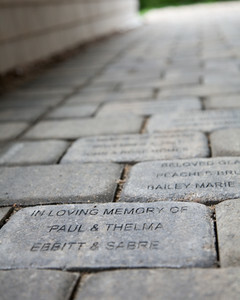 The Tile & Paver Legacy program, offers contributors the opportunity to make a commemorative gift with a message. We have such a short time with many of our pets, but their loss and memory stays with us forever. The Potter League is there for community members throughout their pet's life and after, offering a monthly Pet Loss Support Group. The community events that will be held at the new facility give local residents and former Potter League pets a chance to come back for a visit, and perhaps meet a new friend.